Elizabeth Kania, Hillsboro, Ore., claimed the Derby Novice Non-Pro Championship on her 5-year-old mare, Tuckin Smart (WR This Cats Smart x Tucks A Lil Better x Doc Tom Tucker), scoring a total 643.5 (209 herd/214 rein/220 cow). The performance meant a triple payday for Kania, who qualified for the finals in all three Non-Pro divisions. 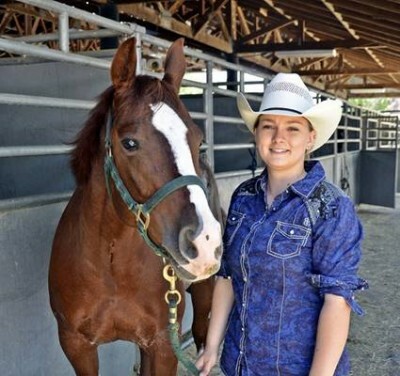 Besides the $1,650 Novice Championship check, she claimed $3,535 for the Intermediate Reserve Championship and another $3,535 for her fourth-place tie in the Non-Pro. Her prizes included a Gist buckle, Platinum Performance gift certificates, and two sets of skid boots from Classic Equine. Kania’s trip to Paso Robles was highlighted by two of the best fence work scores in the preliminaries and the finals. She won the preliminary fence work with a 224, and was the second-high scoring fence run in the finals with a 220. Kania, who recently graduated from Pacific University with a biology degree, rides with Yamhill, Ore., professional Jim Spence. She also has received help from NRCHA Hall of Fame horseman Don Murphy. Spence has hosted several clinics with Murphy at his facility in Oregon. “His clinics are really helpful. I enjoy it when he comes up. It’s hard to say just one thing he helped me improve; I think it’s overall. During the last clinic we had in May, we always run through the dry work first, and I remember him telling me, ‘You’re getting ready for the Derby, so you have to ride more aggressively.’ That’s what I was thinking about when I was showing here – be aggressive, which is not in my nature,” she said, smiling. Kania thanked her herd help – Spence, Dan Roeser, Corey Cushing and Todd Bergen. She also thanked her parents for funding her show career. The Novice Non-Pro Reserve Champion was Kathy Wilson, who rode Chex Out My Tomcat (Tomcat Chex x Freckles Award x SMF Lenas Award) to a 640.5 score (212 herd/209 rein/219.5 cow). The placing paid $1,269 and came with a set of Classic Equine skid boots.